The Crown Cave Scenic Area(冠岩景区) consists of the Crown Cave(冠岩) and the hills, villages, rivers from the Zhujiang (bamboo) River(竹江) in the north to the Yangdi Village(杨堤) in the south. 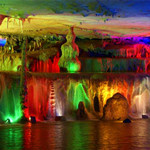 It concentrates many beautiful sights of the Li River, the Crown Cave being most famous. 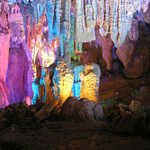 The Crown Cave is not far from the Caoping Town(草坪乡) and is about 29 km south from the heart of Guilin. Due to the crown-shaped hill, the cave beneath was given the name the Crown Cave. 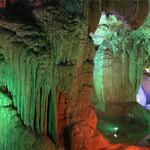 Because of the sweet and clear spring water running out from the cave, it is also called the Ganyan (sweet) Cave(甘岩). 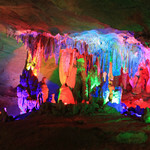 And it is named Guangyan (light) Cave(光岩) because there is a gleam of light from the ceiling of the pitch-dark cave. The overall length of Crown Cave is 12 km. The 3 km near the Li River has been developed and has been open to the public. It is unique in ways of sight-seeing. First you can reach the mountainside by light rail and descend into the cave by elevator. There are altogether five caves. 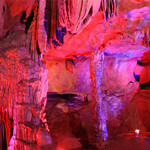 The stalactites, stalagmites and stone pillars inside will capture your imagination and make you want to linger. Then you can take the light rail to Palm Hall. The tallest palm-like stone pillar among the four in the hall is taller than 50 meters, reaching the ceiling of the cave. The ‘palm tree’ is so thick that it takes several people to put their arms around it. It is really a wonder! You can’t help but marvel at the magical power of nature. Then you can take a small boat to experience the distinctive views of the underground river. Many other karst landscapes are waiting for you after you go ashore from the boat. The Crown Cave was listed in the Guinness World Records as a cave with the most ways of traveling. Besides the Crown Cave, the peach and plum garden, folk craftwork shops, cottages and farmhouse and elephant show in the scenic area are all worth visiting.